Glow beautifully and naturally, wherever you go. 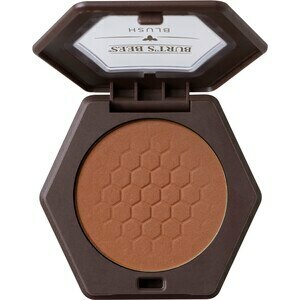 Burt's Bees Blush in Toasted Cinnamon applies and blends easily and evenly. This 100% natural, lightweight mineral makeup features Bamboo, Honey and Vitamin E to nourish skin and enhance your cheeks' natural glow for beautiful results, inside and out. Choose from three luminous shades that complement a variety of skin tones, from fair to dark. Toasted Cinnamon is a tawny brown hue ideal for tan or dark skin tones. Burt's Bees Blush is formulated without parabens, phthalates, SLS, petrolatum or synthetic fragrances. It's dermatologist tested and never tested on animals. Burt's Bees 100% Natural Blush with Vitamin E, Toasted Cinnamon, 0.19 oz: Using a blush brush (not included), apply to the apple of your cheeks and blend outwards towards your temple. To complete a naturally beautiful look, use on top of Burt's Bees Goodness Glows Liquid Foundation or Burt's Bees Mattifying Powder Foundation. Enhance eyes with Burt's Bees Eyeshadow, Eyeliner, Mascara and Brow Pencil, and give lips moisturizing color with Burt's Bees Lipstick or Gloss. Remove makeup with your favorite Burt's Bees cleanser or Burt's Bees Facial Cleansing Towelettes.